We’ve got our hands on the full Nielsen 2015 Music Report. The results offer fascinating insights into radio, streaming, music discovery, music spending, and how dominant Adele really was last year. First, radio. 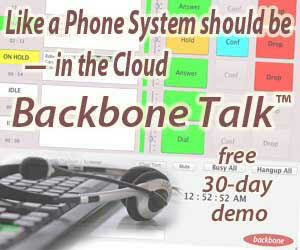 The format demonstrates impressive reach, with 93% of adult consumers tuning in each week. It outperformed all other platforms, including TV and smartphones on that metric. 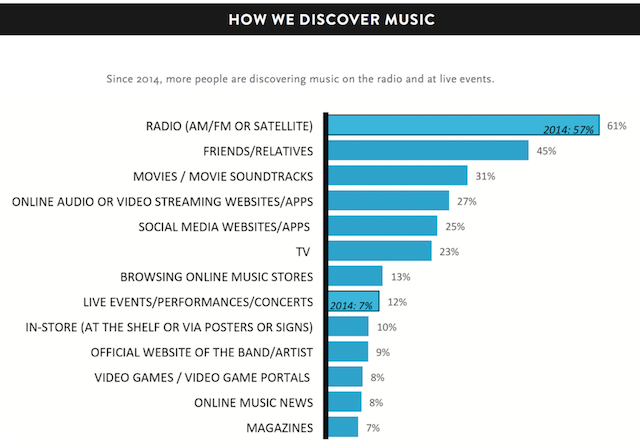 Radio was also the top discovery outlet for Nielsen’s respondents. In 2014, it was a discovery option for 57% of participants; in 2015, it rose to 61%. Nielsen also found interesting genre preferences, with pop contemporary hit radio securing 12.4% and country placing second at 9.1%. Next, streaming. 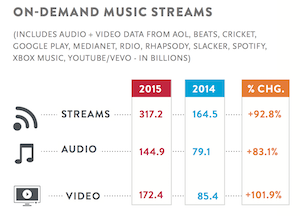 Nielsen’s 2015 report shows year-on-year growth of 83% for audio streaming on demand. 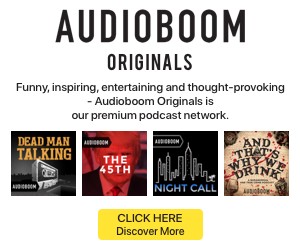 Audio streams from on-demand platforms totaled 144.9 billion last year. Streaming equivalent albums account for 38.5% of total industry volume for 2015. Total digital music consumption – which combines digital albums, track equivalent and stream equivalent albums – clocked in at 411.3 million units. (Nielsen’s equivalency counts 10 tracks as one album and 1,500 streams as one album.) The year’s entire overall album consumption was 549.4 million, which shows just how much the balance of listening has shifted toward digital and away from the physical formats. As in 2014, last year showed declines in album sales: CDs went down 10.8% and digital downloads dropped 2.9%. It’s a minor element in the report, but worth noting that video streaming continues to be a big factor. Video streams had 102% on-year growth to 172.4 billion. This year, we’ll be looking closely to see whether the launch of YouTube Red in the fall has any impact on video’s popularity. The year-end report also includes a reminder of some very pertinent data from Nielsen’s 360 report back in September. That data reveals consumer sentiment about paying for streaming services. Cost is the top reason that listeners use in selecting a streaming platform, followed closely by ease of use. The No. 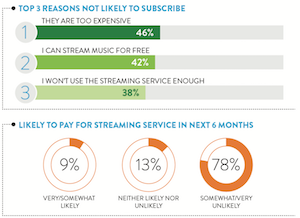 1 reason that listeners don’t subscribe is that streaming services “are too expensive,” according to 46% of respondents. The availability of free streaming is the second reason with 42%, and 38% said they won’t use the service enough. Only 9% said they are likely to pay to stream in the next six months, and 78% said that is somewhat or very unlikely to happen. Even though cost-sensitivity is a major component in the Nielsen findings, the average yearly spend on music has increased from $109 in 2014 to $152 in 2015. Streaming holds 7% of that average breakdown, but it’s 8% of the average teenager budget and 9% for millennials. It’s a much larger proportion than in 2014, when paid streaming was just 3% of the average. Digital downloads account for 13% and physical formats are 13%. 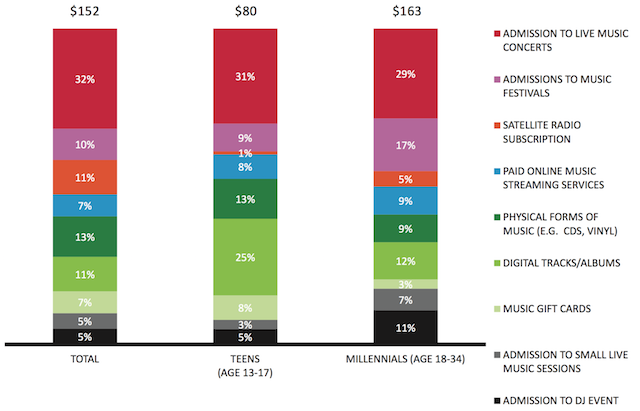 Live music is still by far the biggest slice of the pie, with just over half of the $152 distributed across various event types. Finally, even though her album 25 dropped in November, Adele still managed to smash several records and post staggering results: 3.38 million first-week sales and 7.4 million total for the six weeks of 2015 it was out. The big industry narrative about 25 was her choice to not make it available to stream, but Nielsen’s respondents show that putting it on Spotify et al may not have greatly altered its success. 41% of people who bought 25 in the first week said their choice was impacted by the album’s absence from streaming. However, an impressive 86% said they would have bought the album anyway. So while Adele, Taylor Swift, and Beyonce have made headlines for restricting their big albums’ availability, just as big a reason for their results could simply be the level of superfan support they wield.